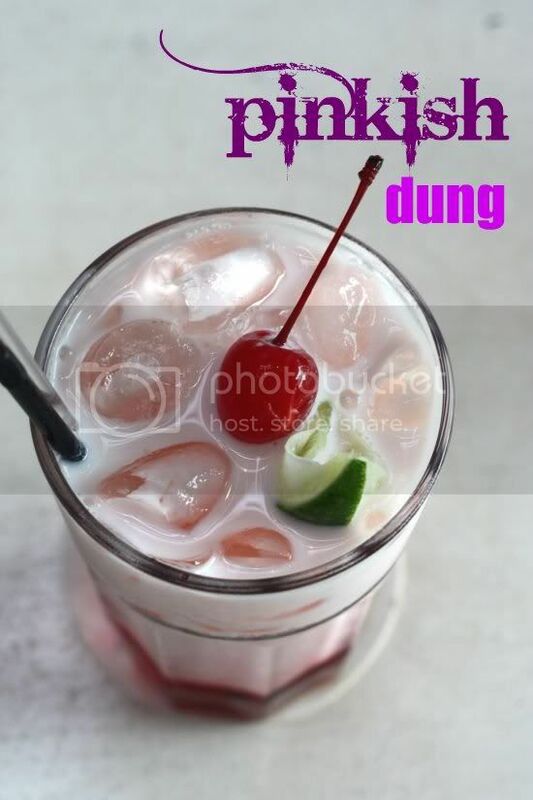 In the books, Selangor may be known as a state that has chalked up a population of around 5 million people but at Erawan Classic Thai & Fusion, it feels like Cheers the pub..."where everybody knows your name". This Thai place is definitely the flavour of the month for many hence the convergence of people here every other night. Walk in here and you'll definitely bump into someone you know. My first visit here yielded one ex-boss and a financial consultant I used to corporate wheel and deal. Lurking in the background was someone else I vaguely remember from my old tuition days. Numerous dining expeditions later, I've racked up a long list of food bloggers, old friends and even a few famous restauranteurs I've met here. It's not only me who have been bumping into acquaintances as Splashie Boy also encountered a few ex-colleagues here. Another food blogger even bumped into her pharmacist here. I guess this little slice of heaven hidden in Kota Damansara is a darn village in the big city. One of the best things about dining here...the food is so great and diverse that you find yourself drawn back to keep sampling the varieties. Take for instance, my latest visit here last week. Friends who visited the place for the first time..Erawan virgins, we call them...are now hooked and from what I gather, later this week another visit has been planned. Don't worry, it's all very respectable...its been just seven days since they walked into this magical place. Run by Anan (who mans the front) and Korn who rules the kitchen with his iron hand, this place is in the most unlikely place - sandwiched between a car workshop and a chicken rice shop. One indication it is a little different from the cookie cutter shophouses is their frontage, framed with greenery and flowers. There's lovely little touches on the outside to entice you inside...orchids floating in the water, cutesy animal figurines and beautiful mosaic patterned tables. Once you're inside, you will be charmed with the whole look - hand painted walls, beautiful paintings, orchids in large vases, and etc. Dining here requires a little discipline and rules. 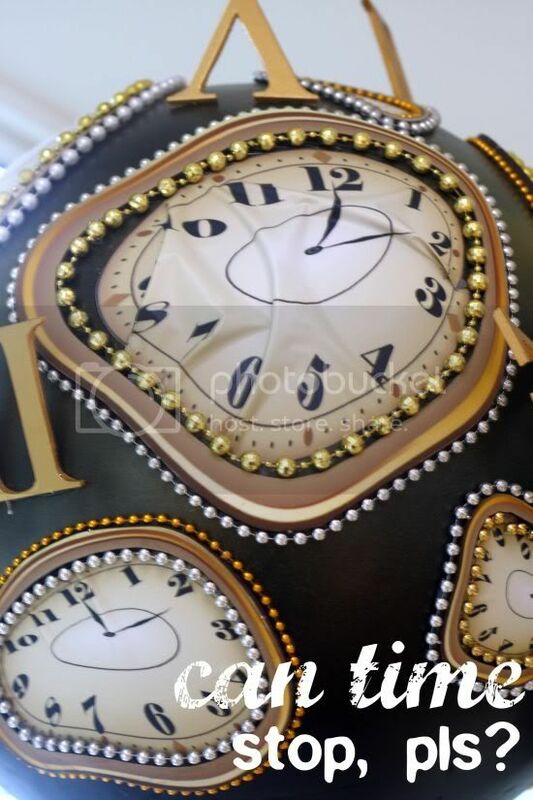 For instance, you need to plan ahead and be punctual. 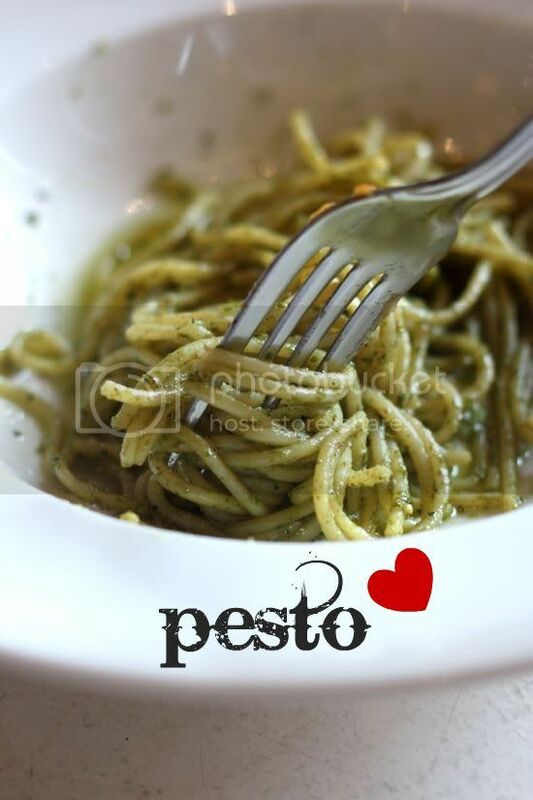 The restaurant runs on the premise - food should be ordered ahead for them to give you the best food and service. It can be quite frustrating especially for those who prefer to dine on a whim but if making a teensy weensy effort on your part gives you great Thai food as a reward, it's worth it. In our many visits here, I've chalked up a long list of favourites that one visit is never enough to cover them. In fact, I often feel like a casanova here, after I decided one is my favourite, I discover something else to slowly edge it down the list of popularity. 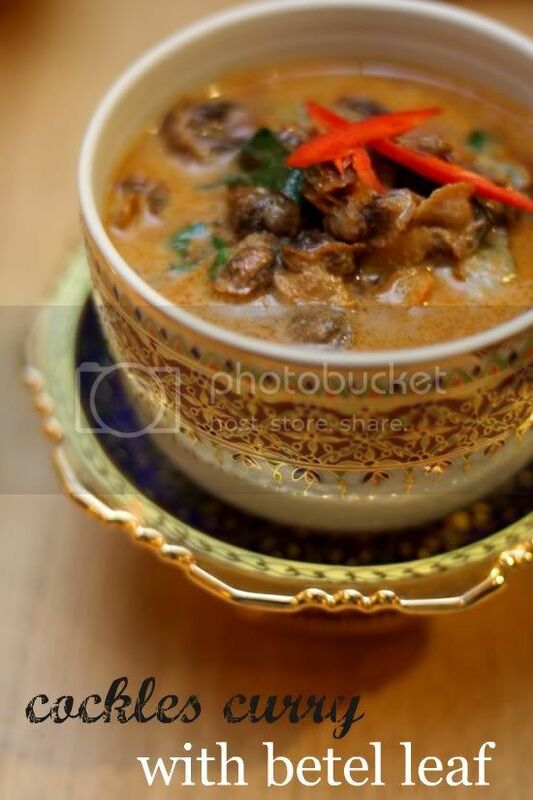 My first love was the roast duck curry - silky smooth to our tongue, the curry mesmerized us all with its sweet flavours from the fresh fruits that we drank every drop of the curry like precious nectar. 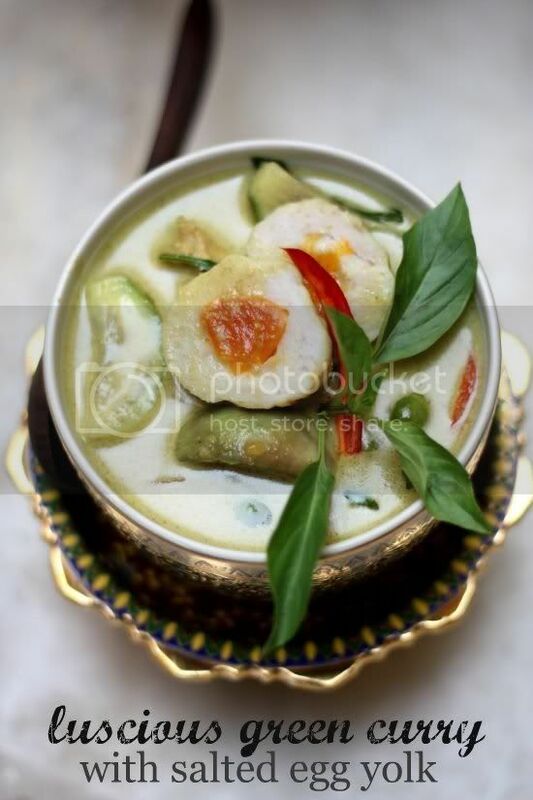 For my second visit, I was enamoured with their luscious green curry with salted egg yolk or more precisely fish paste stuffed with egg yolk. Like an onion, we kept peeling through Erawan's menu to discover more hidden treasures. 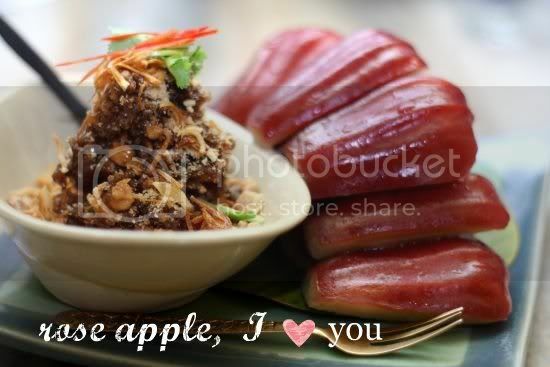 Our greatest discovery was during their appreciation night....the rose apple with special topping. That night, we saw Erawan transform to an intimate place for guests and friends to mingle as the restaurant was celebrating their entry into the Miele Guide. 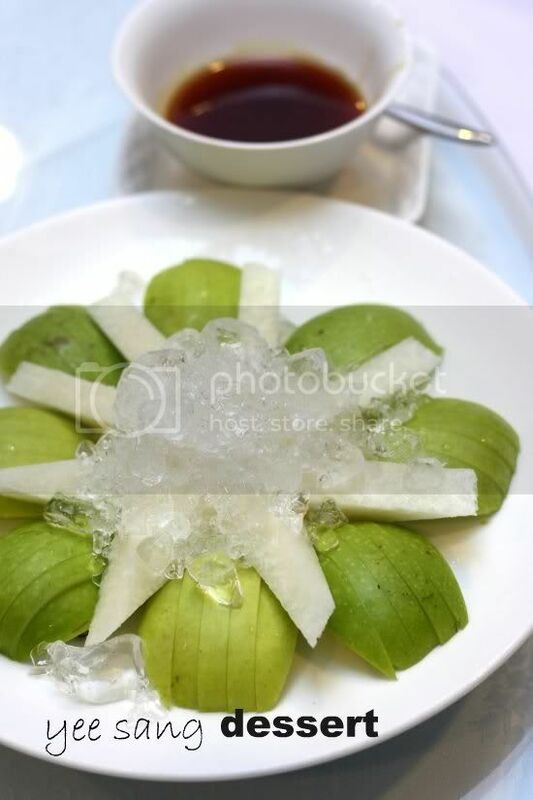 Looking innocently on the table like a fruit dish, we almost ignored the humble looking pieces of rose apple until we took one bite of the whole concoction with a spoonful of the special topping. 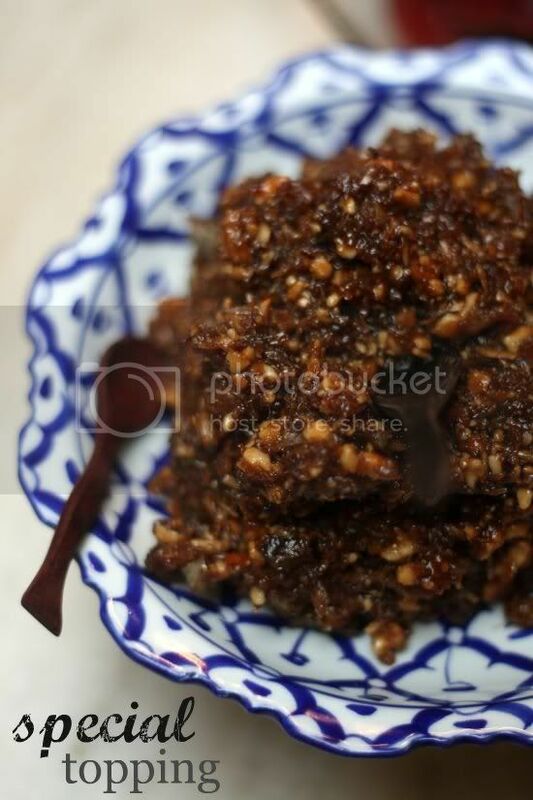 The sweet, fragrant and slightly sticky topping made with cashewnuts, roasted coconuts and dried shrimps complemented the sweet crunchy rose apple perfectly. Needless to say, once the people discovered how wonderful it was, you could see people crowding around the table to keep spooning the topping over the tiny pieces of the fruit. Another night, we discovered the cockles curry. If you are a fan of cockles in your curry laksa, here you have a big bowl just dedicated to that humble bivalve. 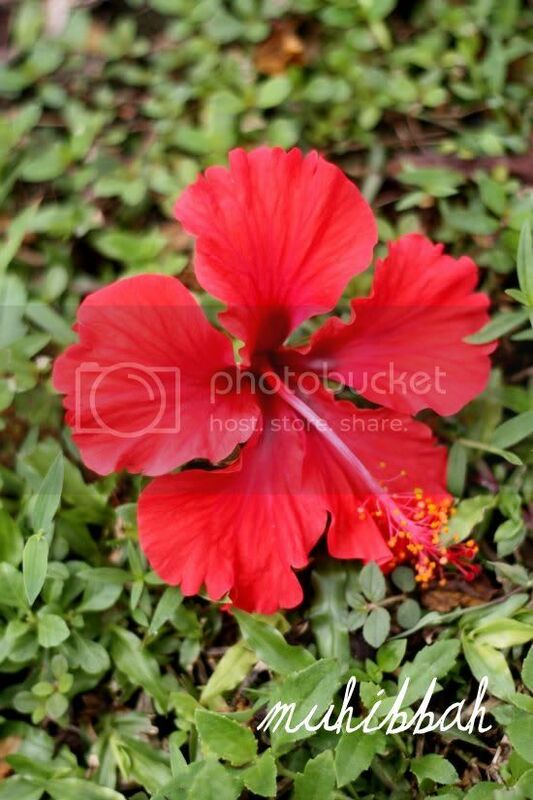 You find yourself drenching your plate of rice with the wonderful curry scented with betel leaf and enjoying every bit of the cockles. 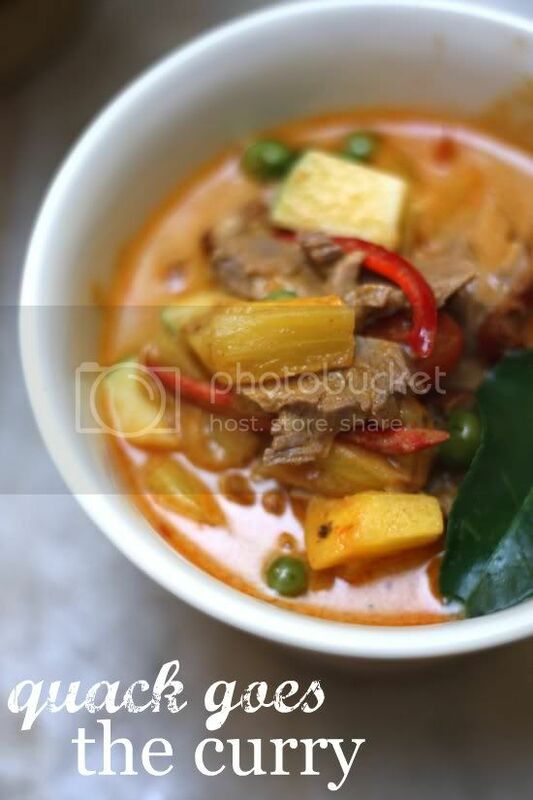 Another curry we love is the Panaeng beef curry - tender beef pieces served with an aromatic red curry. Equally good is the soft shell crab served with the curry cream. It's a rich concoction of curry powder, creamy coconut milk with eggs that begs for you to sully your pristine white rice. For those who prefer light curries, the prawns with pineapple will suit them, while those who love peanuts and sweet curries will enjoy the Massaman curry that is served with chicken or beef. How rude I am, I jumped ahead to the main dishes, when I didn't rave on about their appetizers. For the festive period, there's yee sang available till 17 February. 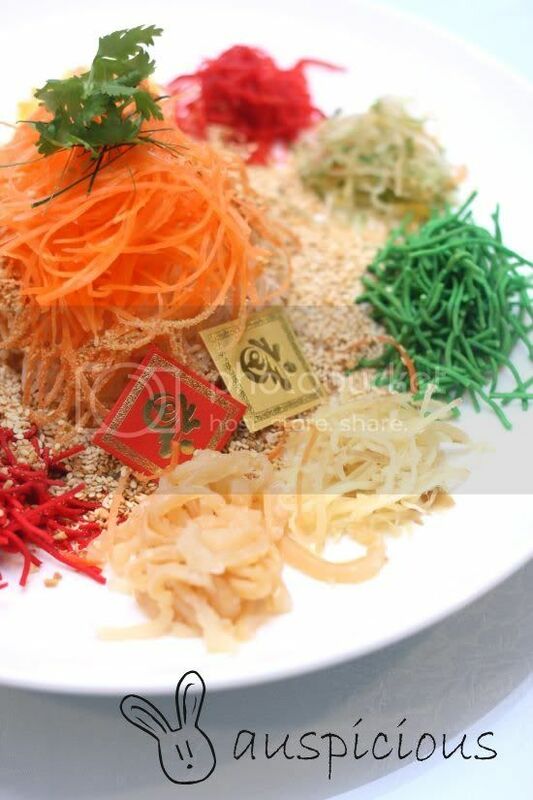 Erawan's version is extremely colourful and healthy with nary a coloured yam shred in the assortment. We spied Thai ingredients such as pineapples and colourful purple cabbage in the assortment. Served with a Thai-ish sauce, it was not too sweet and crunchy after we mixed everything up together with the pok chui crackers. 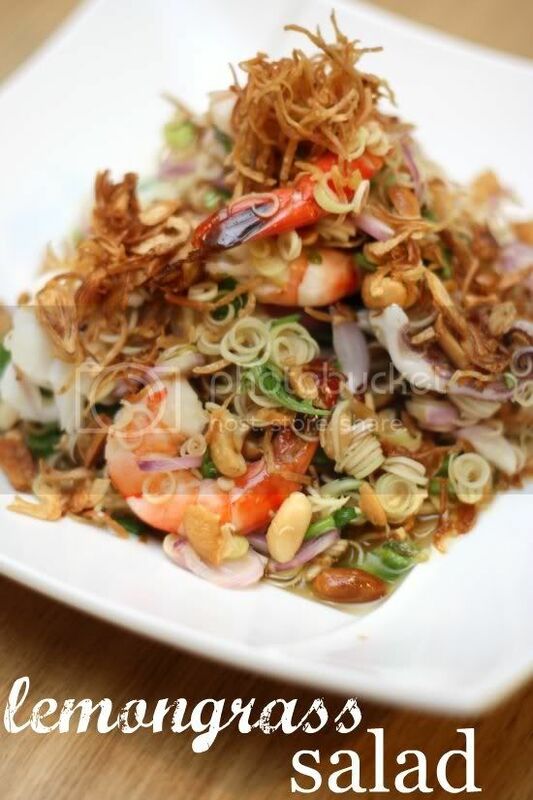 Other appetizers I should rave on about is the lemongrass salad, a crunchy concoction of sliced lemongrass with toasted coconut and seafood. I also love the four angle bean salad. 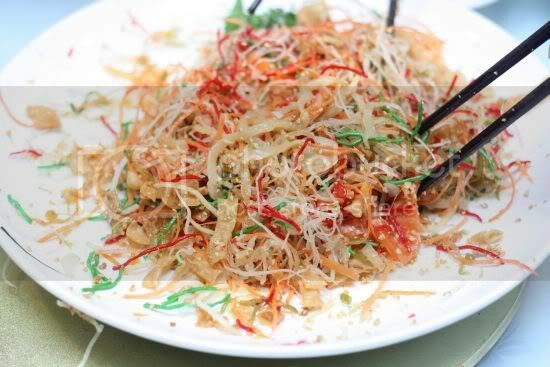 It's similar to the yee sang, as you pour the sauce over the eggs, toasted coconut, sliced four angle beans to toss it together. The deep fried papaya salad is unusual as it reminds me of eating tempura (in a Thai restaurant) with a spicy assorted vegetables dip. 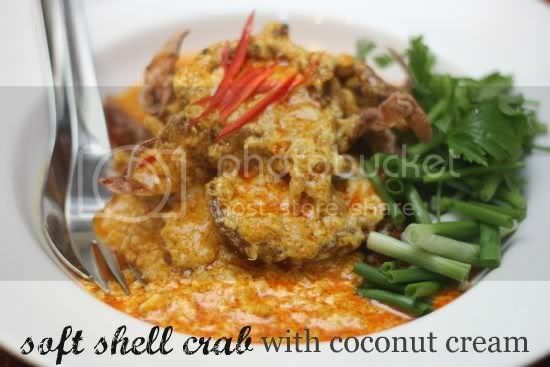 The crab in the shell dish is also good. They're very generous with the crab meat and shrimps and it is served with their homemade plum sauce. A must is their pomelo salad, their best seller. 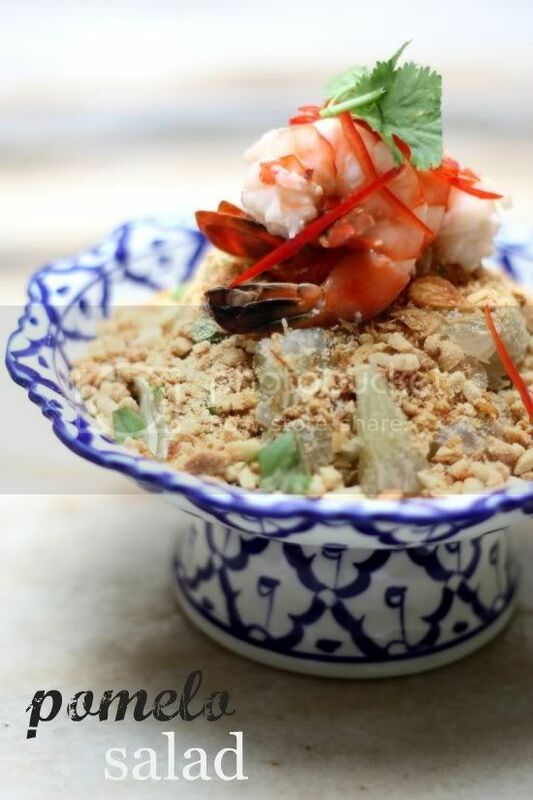 Chunks of Thai pomelo is served with crushed peanuts, prawns and a sweet sticky sauce. 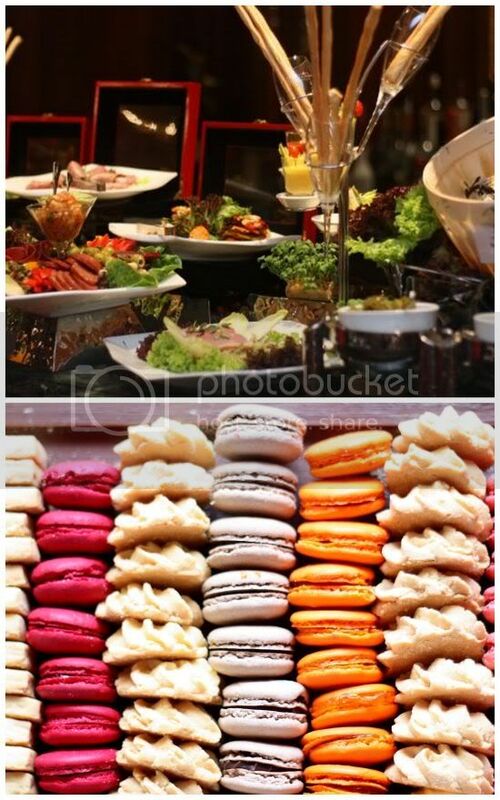 Once you have enjoyed the appetizers and mains, don't forget the desserts as they are equally good. 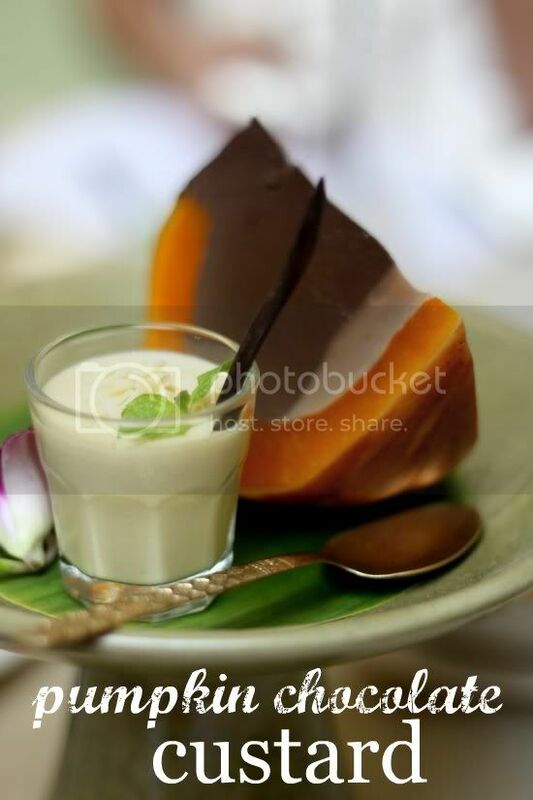 Unlike the usual pumpkin custards, Erawan's version is a different breed as it contains a dark chocolate custard heart. It's also served with a vanilla sauce...that makes it simply divine. A big favourite with all of us is the roast bananas - a dish with soft and sweet bananas that have us requesting for it everytime. 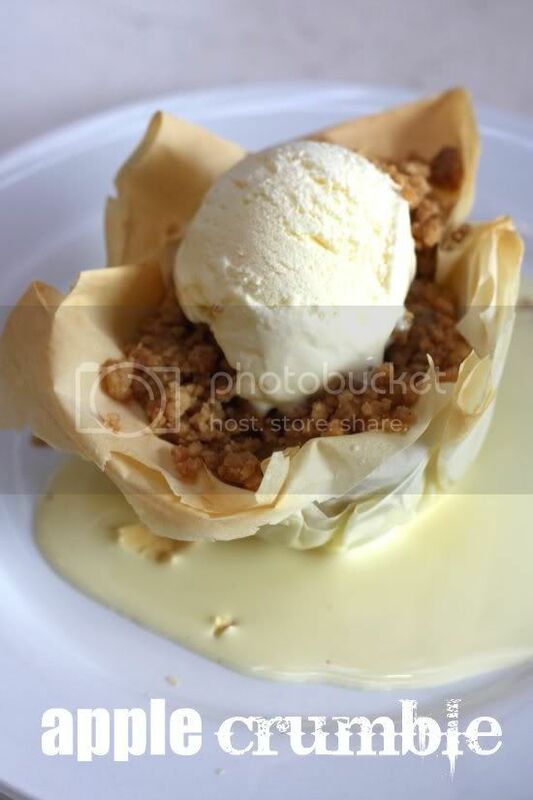 Banana fritters is another alternative for banana lovers - filo pastry crackers with banana. On another occasion, we tried refreshing coconut jelly. 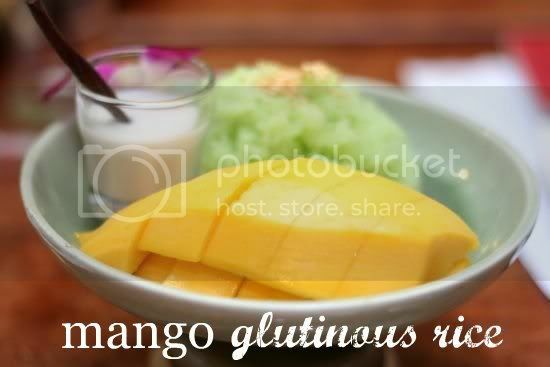 Another favourite is the mango glutinous rice, the Thai traditional dish. They even serve a durian version but it is only available when durian is in season, so grab it when it is served. I've also tried their crisp shallots custard cake in the cocktail party, soft and luscious with an unusual deep fried shallot topping. The tapioca is also very good. 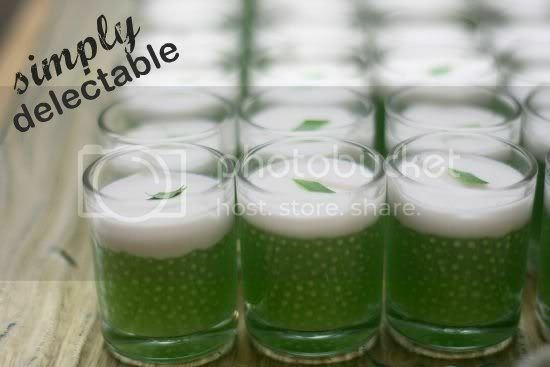 Something else I also tried before in their cocktail party that I love but its not on the menu is the sago with coconut custard topping. Really good as they put a bit of salt in the coconut custard layer. Don't forget their homemade ice creams...the durian one is gorgeous. I hope it's not been a whirlwind as believe me, we have eaten a lot of items from the menu. Just go through the Flickr set for the full set of pictures. You can run through the Erawan's menu on their website. Study it and make the right choices for your pre-booked dinner. Hopefully you will discover and fall in love with this little gem of the place like all of us have. I'm looking forward to my next visit here already after running through my pictures since everyone of them has me salivating especially late in the night. The Year of the Rabbit is just around the corner...in about three weeks time. Tis' the season to feast and celebrate with customs rich in auspicious meanings. In the Chinese New Year festival, food plays an important role - uniting family for the all important reunion dinner, gathering with fellow workers to mark the end of the lunar year and of course, the get-togethers with friends to feast on the festive goodies. One of my favourite traditions is the yee sang. 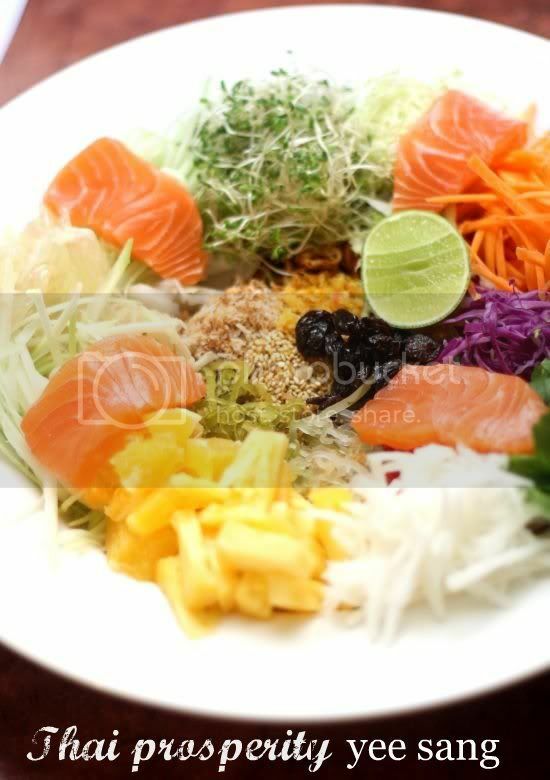 Essentially it is a salad in essence packed brimful of assorted vegetables, crispy crackers, sesame seeds, peanuts and raw fish, all tossed in a plum sauce. Previously reserved for the seventh day of the Chinese New Year (i.e. Yan Yat), nowadays restaurants capitalise on this tradition by serving the auspicious salad as soon as Christmas is over. At Chef Choi's, in a celebratory dinner among good old friends who are devout foodies, we sample one of the best yee sangs in town. Going down to the core of the whole dish, Chef Choi's owner had concocted their own secret yee sang sauce that lightly dresses the salad. Made with preserved plums, apricots and the ingredient X from China, the sauce is so delectable, we end up having it for dessert! The yee sang is lightly anointed with the yee sang sauce....just a smidgeon to coat the vegetables and raw fish so the textures don't mash up into each other until they are no longer noticeable. 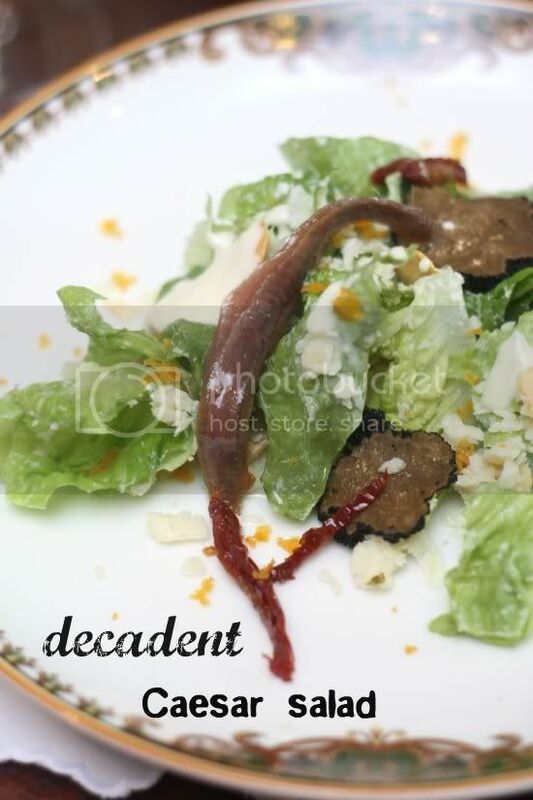 Unlike other restaurants that drench their festive salad with the sauce, the mouthfeel here is different since the dough crisps remain crackly good. A feast is never the same without a deluxe item since celebrations always call for "the best of the best". 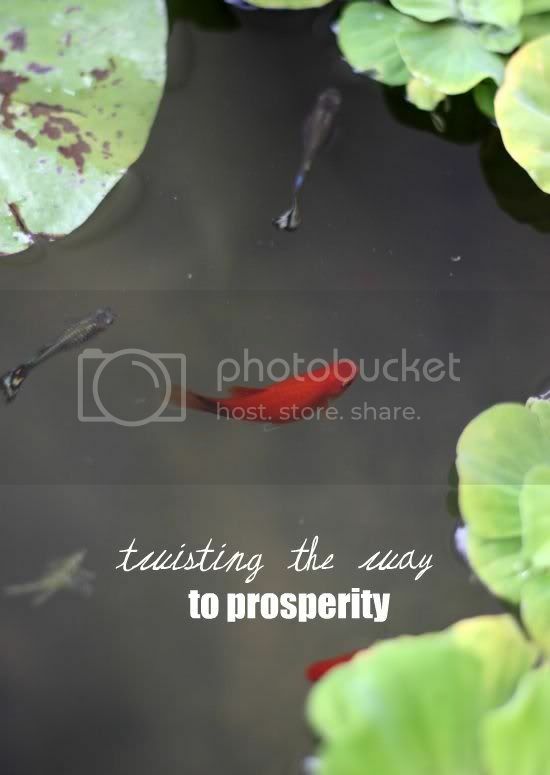 This is said to symbolise wealth and I guess in terms of positive thinking, probably wealth in the upcoming Lunar New Year too. 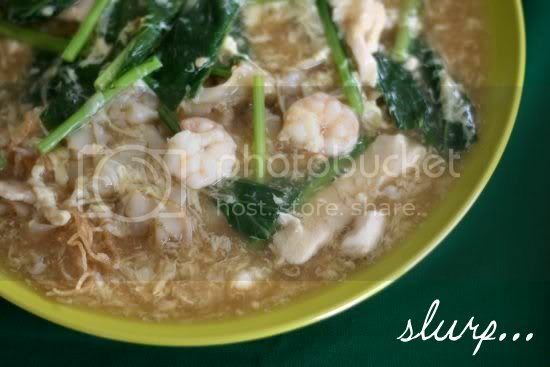 In this simple yet decadent feast, we supped on what the Chinese term as fatt tiu cheong - the prized soup filled with the most luxurious ingredients. Also known as the Buddha Jumps Over the Wall, legend claims that the soup was so enticing that it tempted a monk to leap over the wall to taste the wondrous soup. 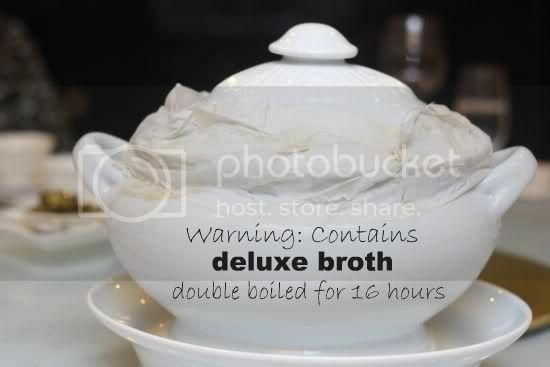 This deluxe version (RM450++) is double boiled over a slow fire for 16 hours. All the goodness is sealed in a large tureen glued tightly together with paper and egg white. A whiff of the slow cooked soup may not make us jump walls but we were tempted too since it was incredibly concentrated with the essence of all the wonderful ingredients. The soup is served in a special manner, layer by layer...the first for me even though this is not the first time I'm eating this dish. 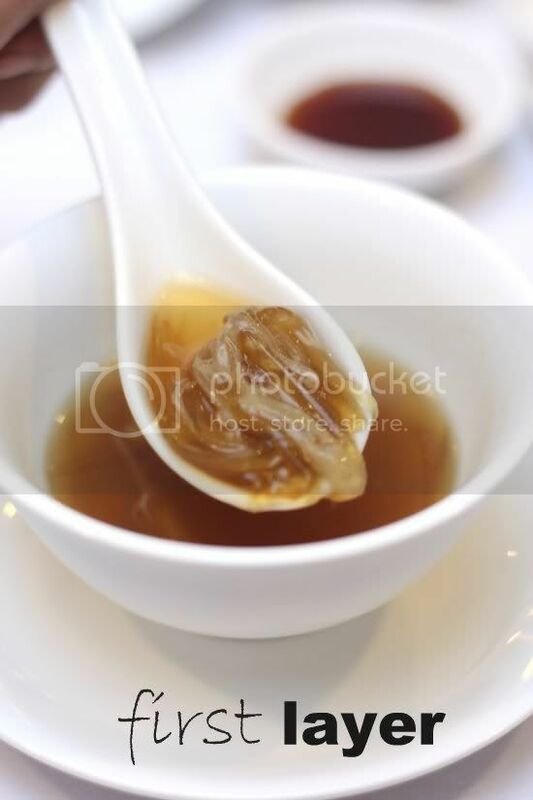 The first layer is thick and slightly gummy from the collagen from the sharks fin and rich with the abalone essence. 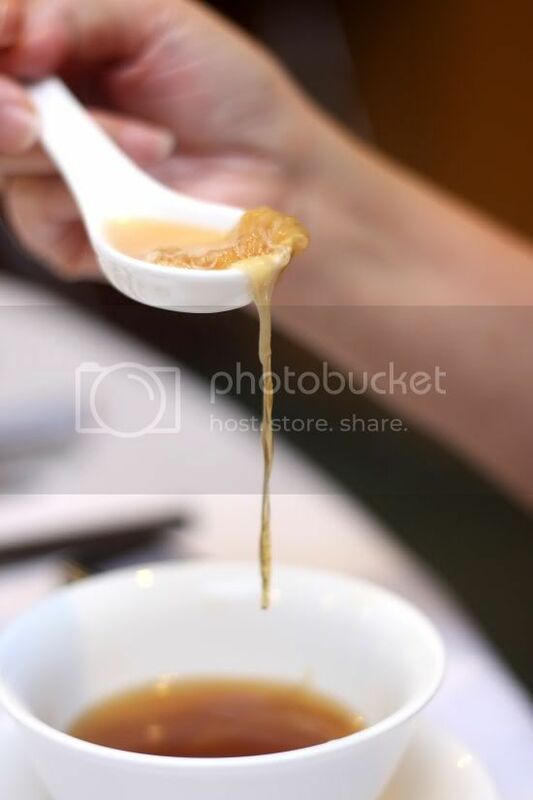 The key to the aromatic soup is the prized cordyceps that resemble worms. These small unassuming Chinese fungi can fetch a crazy whopping prices and was by far the most expensive item in the soup. 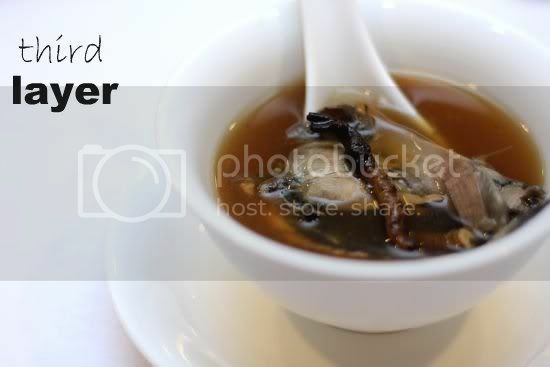 Nowadays, due to the difficulty to source for cordyceps, most of the soups contain cordyceps flowers, a cultivated fungi with an aroma similar to the prized ingredient. 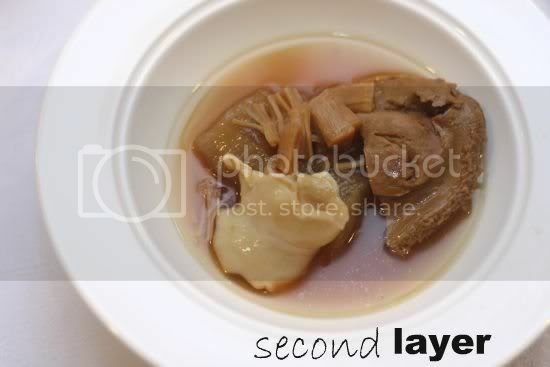 The second layer had us enjoying each of the ingredients - the sea cucumber that is a blob of soft collagen, the fish maw, the whole Japanese scallops and the fork-tender soft abalone. The soup is not as rich as the first drawn thick broth but still incredibly aromatic. Lastly, we enjoy the tender black chicken with the prized cordyceps. The whole dish is incredibly tummy satisfying especially since that night was a little chilly from the heavy rain. 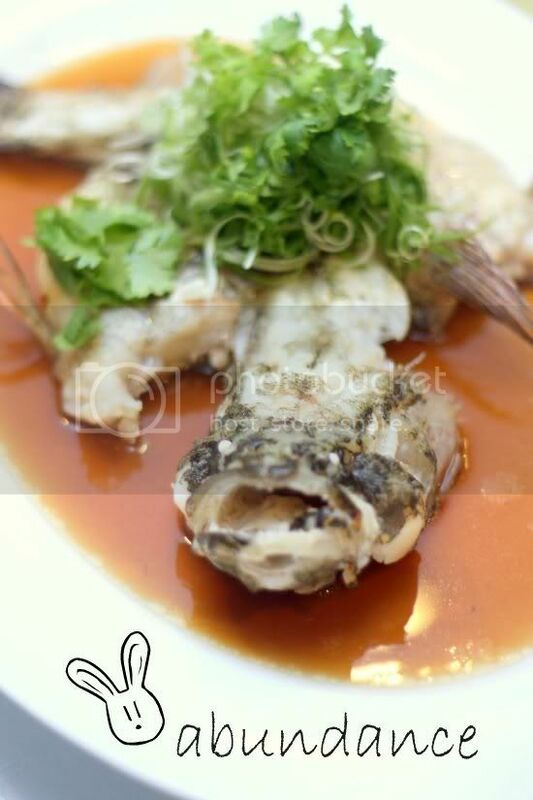 Next is another prized dish, steamed soon hock (bamboo or marble goby fish) in soy sauce - the best way to enjoy this delicate and sweet flesh. Last but not least, it is Chef Choi's special waxed meat rice. Unlike other restaurants, where this rice dish can be overly decadent and cloyingly rich, this version is light and fluffy with the use of basmati rice. It's even low GI so health freaks don't need to worry if they ask for a second helping. 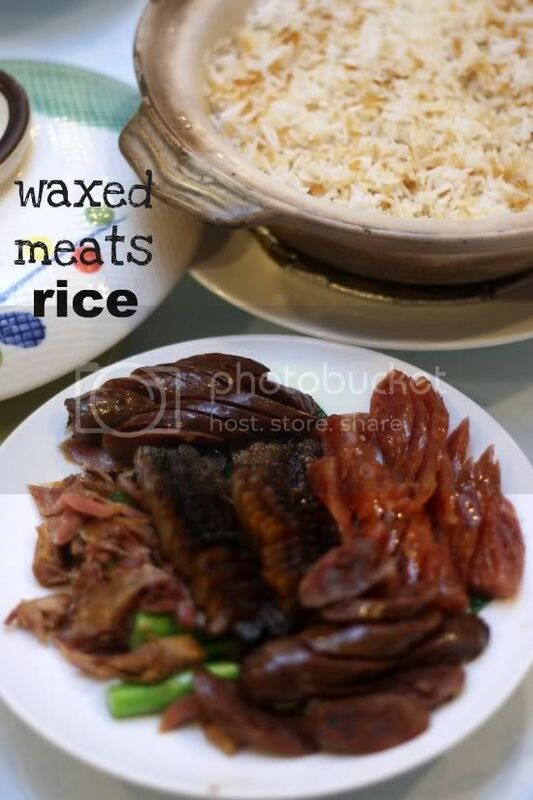 There's no crust but you can enjoy bowl after bowl of the fluffy rice with the aromatic waxed meats. Again the goose liver sausages are my favourite...they're from Hong Kong's famous Yung Kee Restaurant. That night we made history, ending our meal with freshly cut fruits with the yee sang sauce on the side. The yambean and the green apple goes so well with the sweet and fruity sauce that one is not enough. 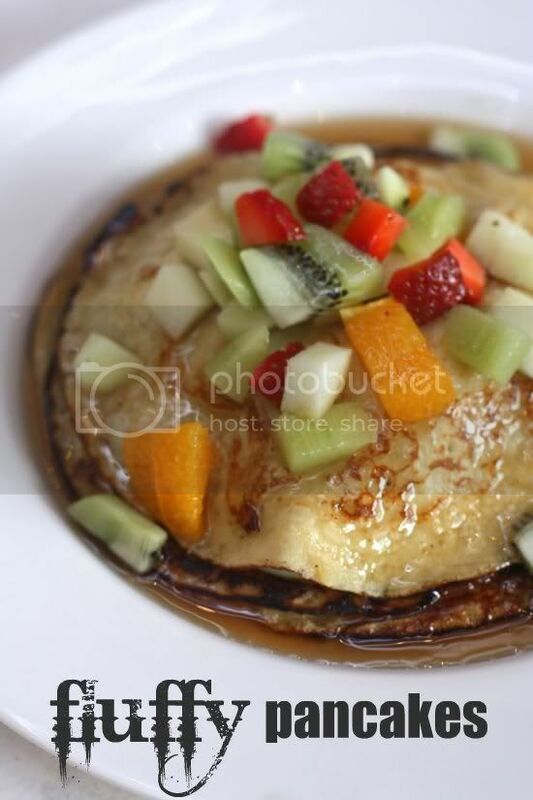 It's also a great ploy to get us to eat more fruits as the sauce is simply addictive. I reckon we made a revolutionary discovery that night and who knows, this may be the start of a new dessert for the restaurant. I'm sure you must be enjoying the run up to the festival with all the feasting. Just remember, all this is for a cause since it is filled with auspicious symbols to usher in a prosperous Lunar New Year. *Note that this meal was not paid by the reviewer. I have a soft spot for truffles...they're my Kryptonite. Show me those black diamonds and my knees go weak while my mouth goes dry in anticipation. Hence, when a good friend whispered that Sage was having their winter truffle menu, I could feel my breath getting short. Who cares if I just had truffles barely a month ago. 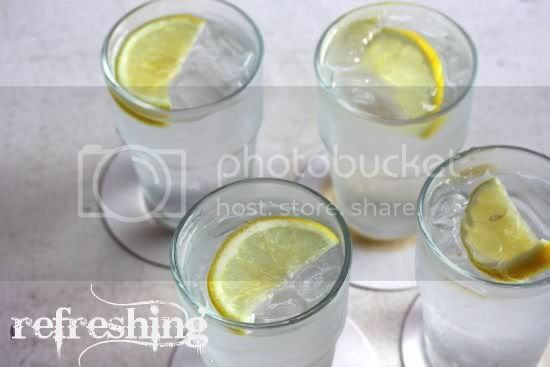 Isn't it the time to indulge I rationally reasoned with my conflicted brain since I was celebrating the year-end? Thus, I ended up having one of the most brilliant truffle lunches (it's usually available for dinner but they made a special exception for us). 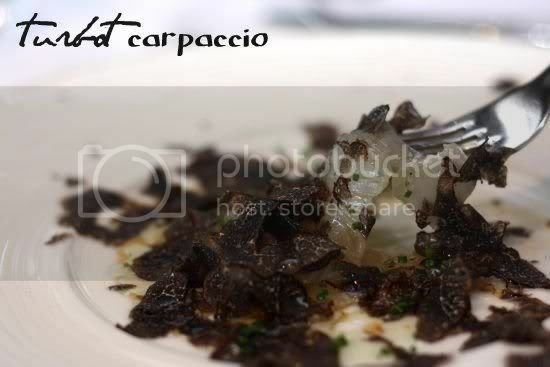 It was literally raining truffles that day - on my turbot carpaccio, fanning my silky pasta strands, dotting my crisp skinned pan seared seabass and even adorning my creamy vanilla ice cream. When we first started our meal, I had to chuckle when the appetizers were served and I tried to snap a picture to capture the dish. Where's the turbot amid this shadowy black dish? It was literally like the Chinese movie title - crouching tiger hidden dragon. A peek under the dense cloud of the black diamond shavings revealed the wonderfully fresh fish sliced thinly and anointed with a dash of oil. Its a wonderful combination that I slowly savour every mouthful. 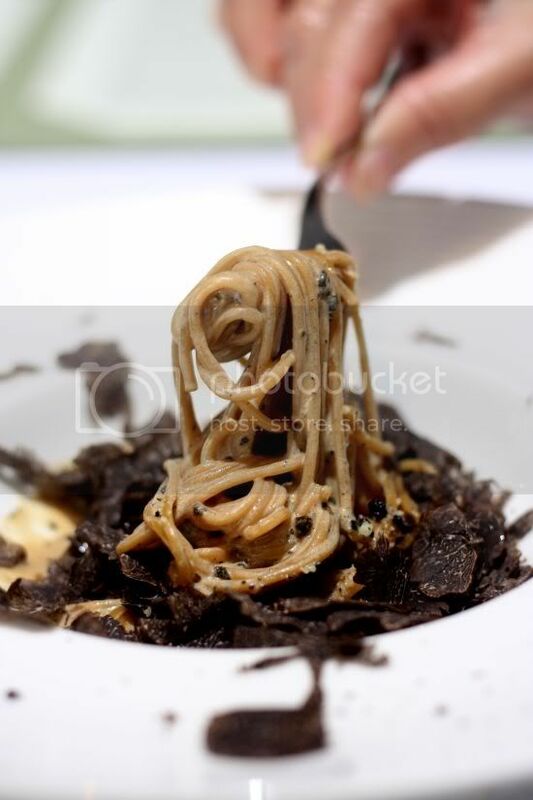 Next it was the pasta dish, similarly decorated with the heavy fall of truffle shavings. It's almost unnoticeable until we push aside the delicate shavings to reveal the strands. I dreamily slurp down the pasta twirls while catching the bits of the black shavings on the side. Even though Angus beef tenderloin was on the menu, I wanted a lighter option hence they kindly allowed us to switch to a pan seared seabass. It came with an added bonus - a perfectly cooked Hokkaido scallop on the side. 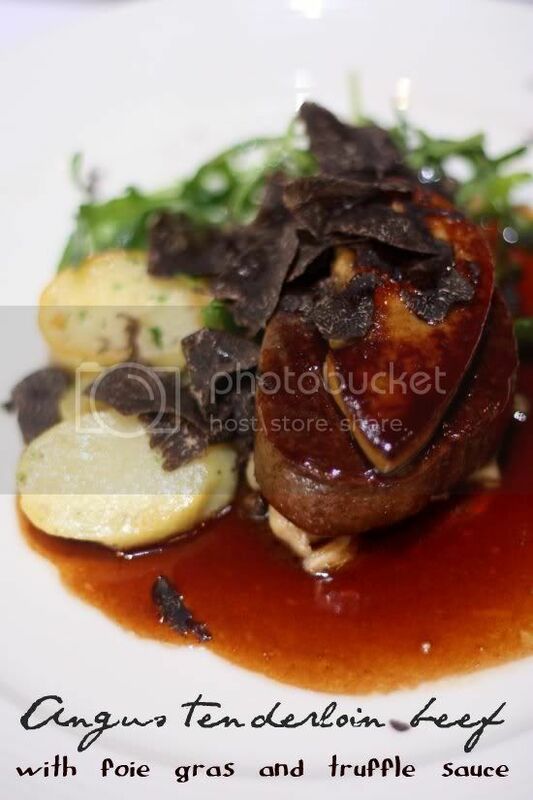 The sauce was a little sweet but it balances out the earthy taste of the truffles. 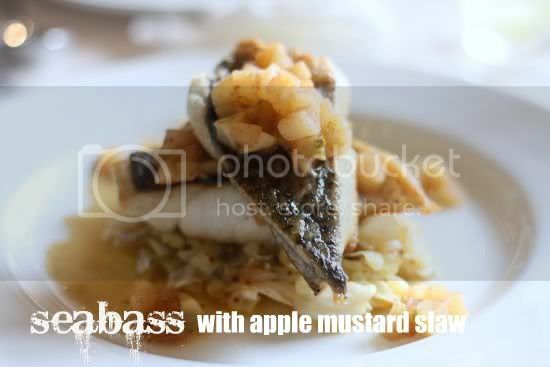 I've always loved the seabass here since they do it so well with that crisp pan seared skin. I get a taste of the beef, which is equally good but just on the heavier side since its also paired with foie gras - triple decadence in one plate I reckon. We round up the wonderful meal with an interesting dessert in the form of truffle ice cream that turned out to be vanilla ice cream topped with truffle shavings. I especially loved the creamy sabayon dotted with fresh fruits on the bottom layer. 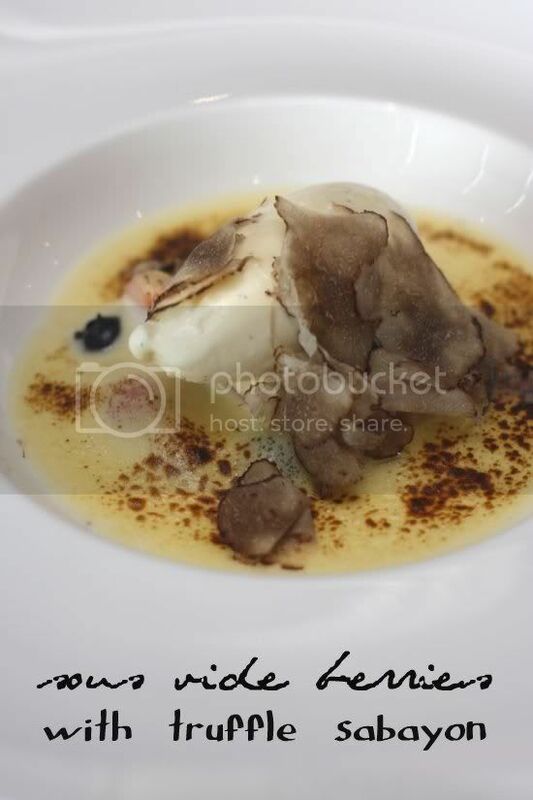 After so many shavings of truffle, you can start feeling the room turning upside down. Maybe after that truffle haze has passed, you'll just notice it was ceiling mirrors that give you that effect. 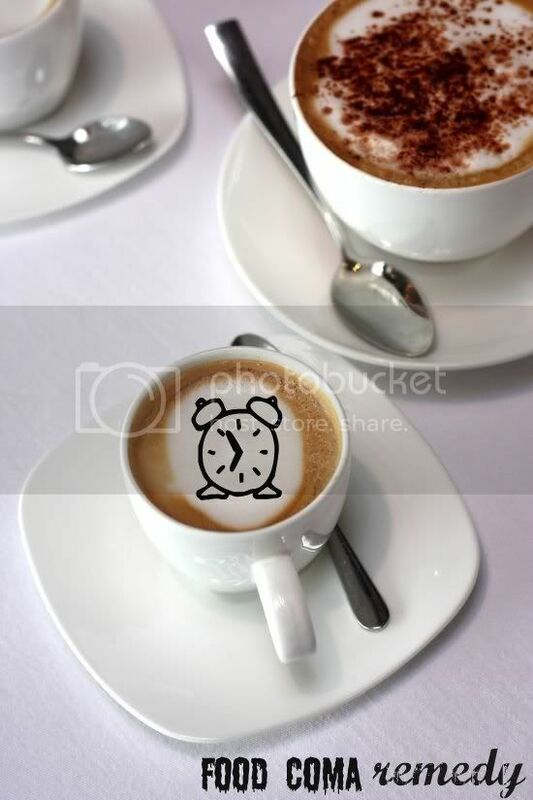 We end with macchiatos and a cappuccino to chase the food coma blues away. It works for a while but some of us had to get some shut eye after such a heavy decadent meal. 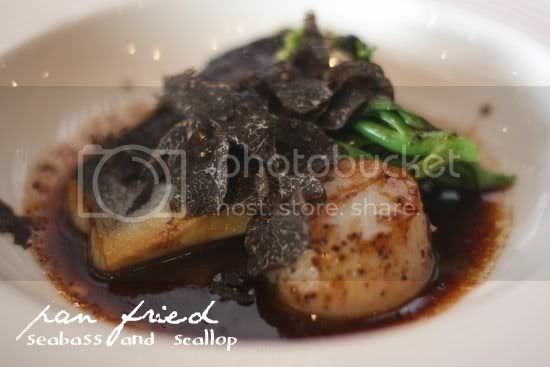 Priced at RM250 nett per person, it is definitely a must-do especially if you love truffles. Go on...you need to celebrate, just find any excuse like me. 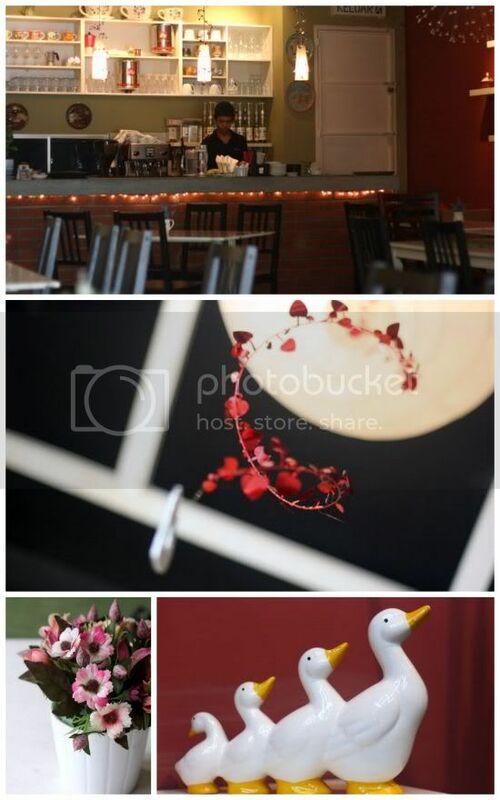 Old established restaurants are like old friends - so familiar that you know you will end up enjoying yourself. Just like long forgotten friends, when you dine at these places, everything seems to fall to place once things start up. One such place is Muhibbah Seafood Restaurant, the Chinese Muslim stalwart that has been around since the 1980s. A fixture in the Taman Tun Dr Ismail dining scene, the restaurant recently moved to Kg Sg Penchala to a stand-alone bungalow premises that used to play host to weddings. Looking around the restaurant set up, one can see the little touches Muhibbah was familiar for - the plate with the dipping sauces, cutlery and wet towels served in the beginning, the pristine clean open kitchen seen through glass panels and the drinks being brought to you in a small metal tray (that always remind me of a baking tin!). Most importantly, food standards are maintained and they still have the best deep fried sotong (RM10 for a small portion) in town. 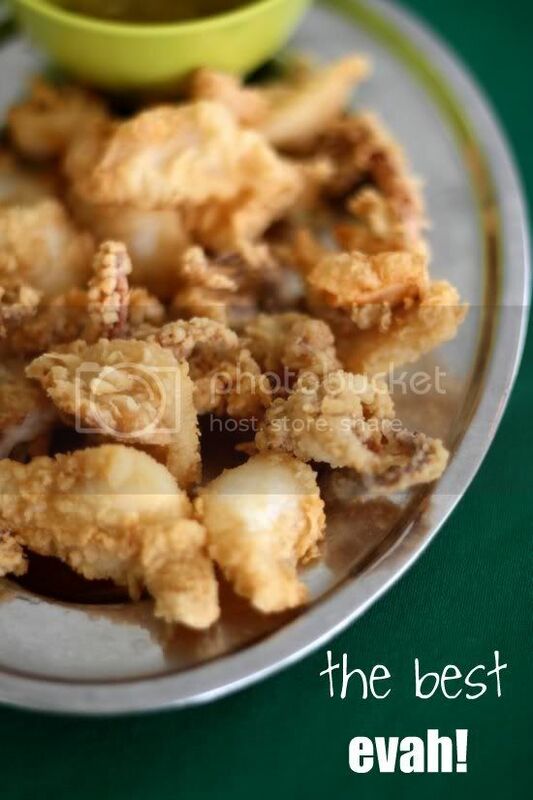 Covered in a crunchy light batter the calamari is always perfectly cooked and never rubbery. 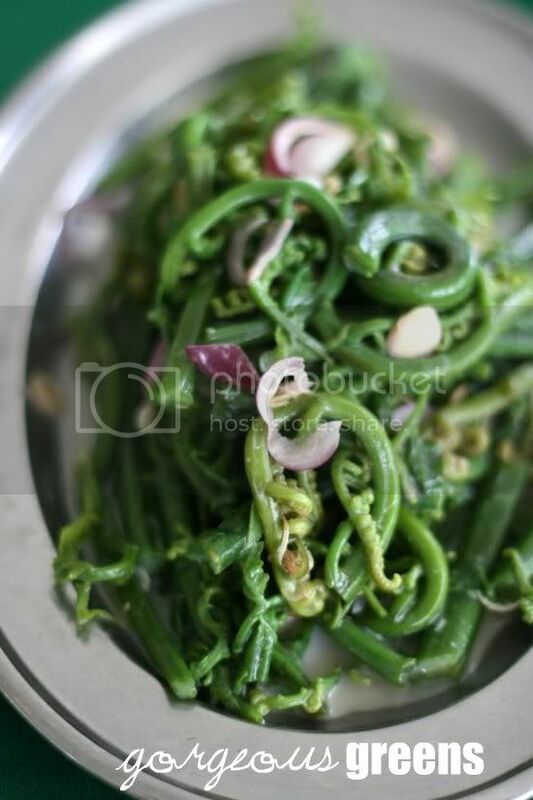 Another big favourite here for us is the kerabu paku pakis (RM6 for a small portion), where tender ferntops are served cold and dressed with coconut milk, lime juice, chopped birds eye chillies and lemongrass. 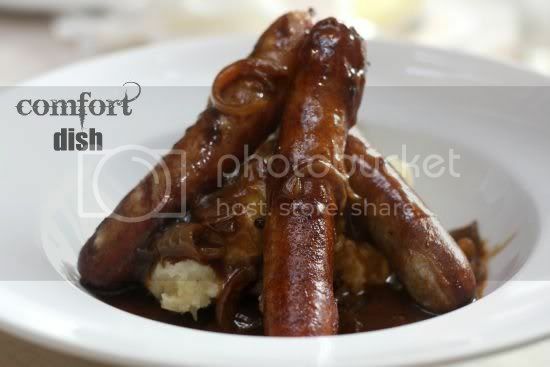 It is a tangy yet light dish that seems to bring out the sweet taste of the ferntops. In my opinion, it is one of the best renditions of that humble vegetable I've grown mighty fond of throughout my eating years. There's a string of tummy favourites like the Cantonese Fried Noodles (RM6.50 for a small portion), fried lala, fried fish and etc. What's interesting about Muhibbah is the Chinese food served here appeals to everyone including my mega fussy Aunt. If you think my mother was particular about her food, my aunt is worst as her palate is severely limited to the delicate flavours of Chinese food (she never ate roti canai until recently claiming the Indian spices overwhelm her). Ever since we introduced her to this place, she's been returning here for special occasions such as whenever her children return from overseas. 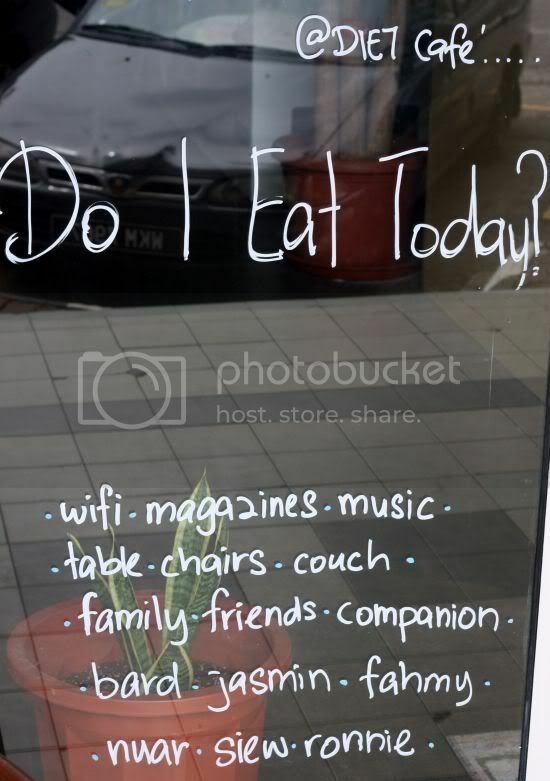 In their previous Taman Tun Dr Ismail outlet, as they were adjacent to a church, you'll often see a mixed bunch of people dining here - the early Chinese crowd especially the ones after church while the Malays dine much later after maghrib prayers. Occasionally, there'll be a stray Westerner (maybe in the form of Eating Asia, who are also big fans of this place), making this place truly muhibbah in all senses. Here's hoping business at Muhibbah continue to prosper as I'll hate to see one of my absolute favourites dissapear from the food landscape of Malaysia. Quick, go try the deep fried sotong and kerabu pucuk paku and I'm sure you'll end up being an absolute fan of their simple unpretentious Chinese halal food like my whole family. Weekends are meant to be lazy decadent breaks so we feel charged up to hit Monday with a vengeance. One place to enjoy the good life is at The Ritz-Carlton, Kuala Lumpur. Dining may be limited to few choices here but when it comes to making things count, the people at The Ritz-Carlton definitely know how to put on a masterpiece of a meal, making you dream up plans to spend the whole weekend here. 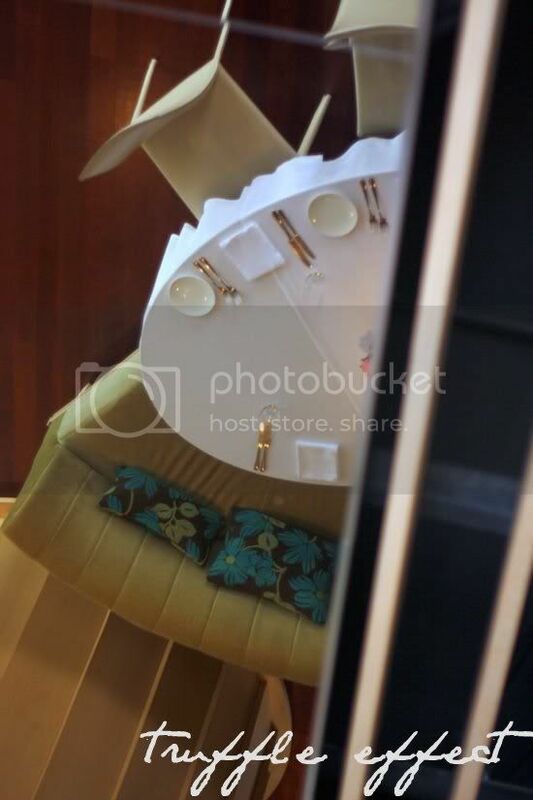 Located just on the ground floor is the Lobby Lounge where you get to break the monotony of the daily life (except Sundays) with their afternoon tea break from 3-5pm. It's a great place to relax and chill out especially if you rather take a quieter approach. Imagine soothing harp music, tinkling teacups, and catching up with the gossip at this cosy setting. 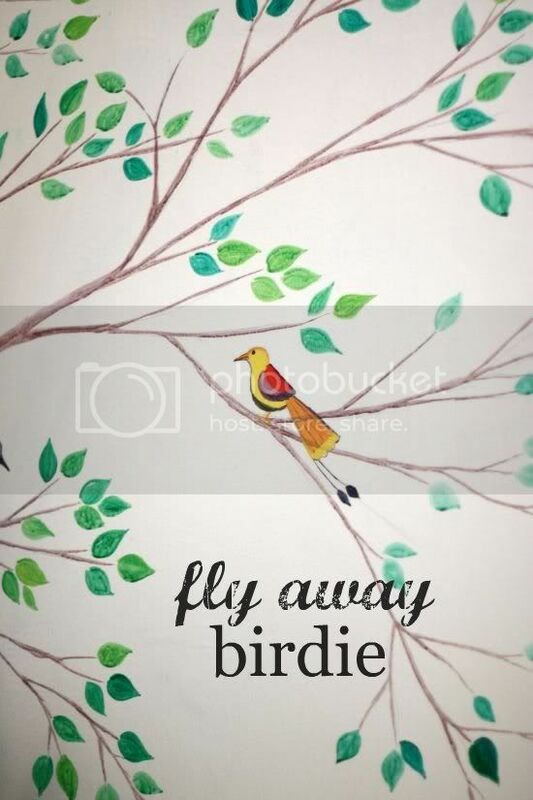 Definitely the grand life that makes you wanna break out in song and sing...Summertime by George Gershwin from Porgy and Bess...."summertime, and the living is easy..."
Unlike the more bustling Sunday Roast Lunch, teatime here is a quieter affair. Once you sink down in your comfy highback chairs (or the sofa), you get to select your choice of tea from a trolley. There's about 40 choices from the fine tea-merchant Ronnefeldt - fruit, green, black and even herbal ones. 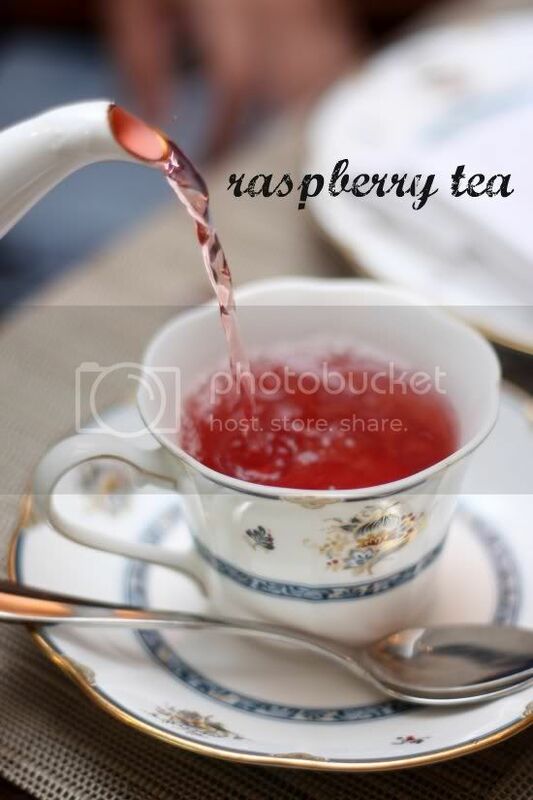 Splashie Boy is partial towards the more aromatic fruit teas hence his choice is a ladylike pink Raspberry fruit tea while mine is a robust vanilla black tea, a favourite of mine ever since I discovered this in Mauritius (they're crazy about vanilla there and even the airline serves it). The tea is brewed in individual Narumi bone china teapots that are placed on top of a warmer. You can ask for the tea to be topped up with hot water that is placed in a tea samovar at the front of the restaurant. After waiting a while, you get served a three tier stand full of goodies. Work your way down like Hansel and Gretel following a bread path from the savouries, scones and ending with the sweet chocolate treats at the end. It is the best ever food discovery. 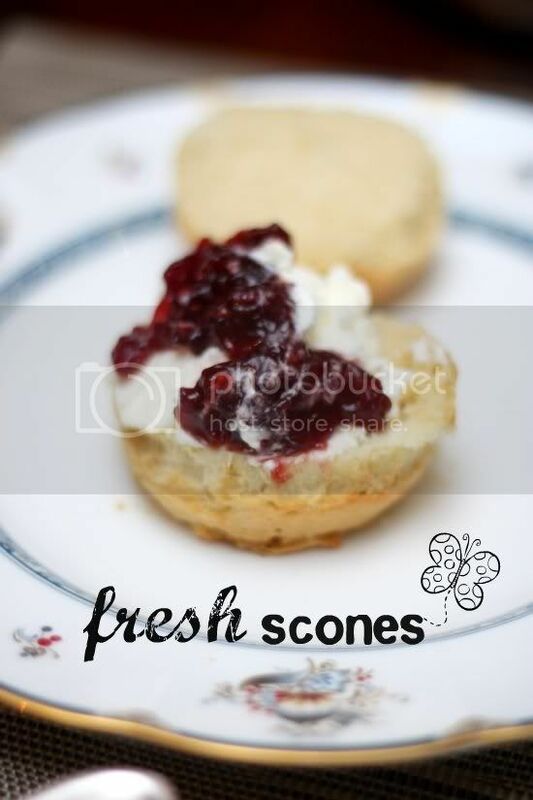 The scones are freshly baked and gorgeously light. You're served with shot glasses of spun white clouds of whipped cream (it's too soft to be the heavy dense clotted cream I used to get in Devon) for you to slather on your scones. There is also a choice of three mini jams from Bonne Maman - raspberry and strawberry preserves plus bitter orange marmalade. 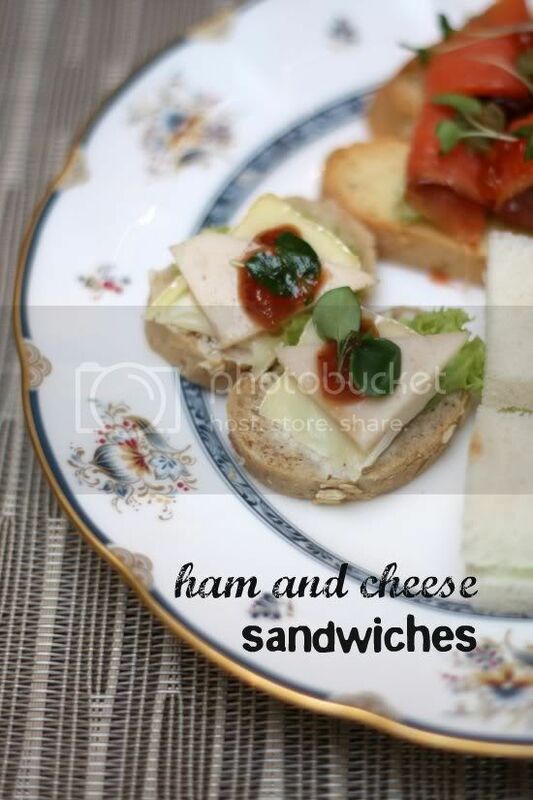 I love the savoury treats too - the wafer thin cucumber slices pressed between white bread, the decadent smoked salmon pieces artfully curled on the piece of bread, the discreet dab of chutney on the brie and ham bites, beef bacon quiches with a light airy crust. However my favourite childhood moment were the mini chicken pies. Topped with a puff pastry hat, these teeny weeny pies had a creamy chicken filling with mixed vegetables, just like those gigantic ones we used to get at Jaya Supermarket's bakery. Reaching the third layer was a slow and steady trail, I wasn't too enthusiastic about the fruit tartlets even though they look so pretty with the edible gold leaf since the tart crust was a wee bit too hard. Neither was I game for the bright pink strawberry cream piped within my chocolate eclairs but I loved the light as air mango cheesecake. Surrounded by dark chocolate pieces, I savoured each bite of the cheesecake on top of each bittersweet chocolate piece. I left the brownie till the end as it looked dense but a bite at the bottom revealed a surprise find - pecans! A little on the sweet side, it was still very good especially with the raspberry mousse topping. For more pictures on the afternoon tea, see the Flickr set. If afternoon tea is not your cuppa of choice, make way instead for their Sunday Roast Lunch that is filled with all the good things in life. 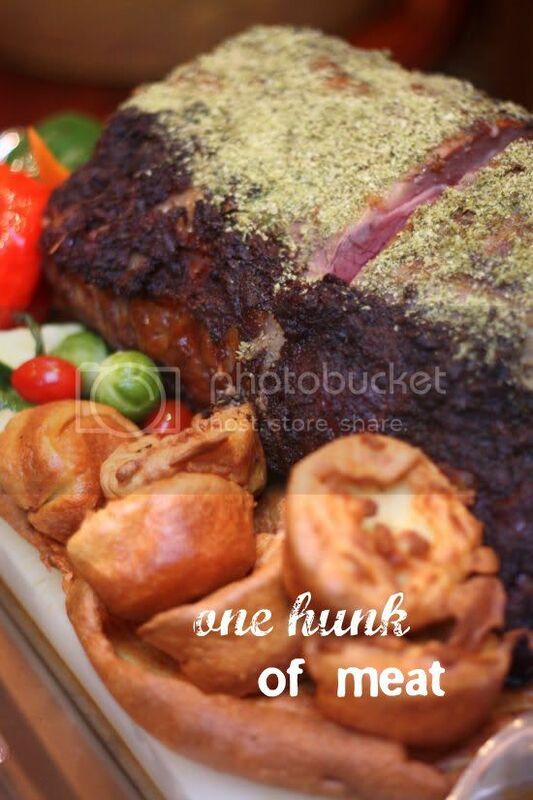 There's of course, the customary Prime Rib - a huge hunk of meat that is sliced and served with very traditional Yorkshire pudding and of course, lashings of gravy. Various choices like roast lamb and a lovely salmon kedgeree en croute (wrapped in puff pastry) is also available. The selection of items here may be smaller than other hotel buffets. However, the Ritz-Carlton emphasises on quality ingredients hence you will find everything is exquisite right down to your ala-minute tossed Caesar Salad. 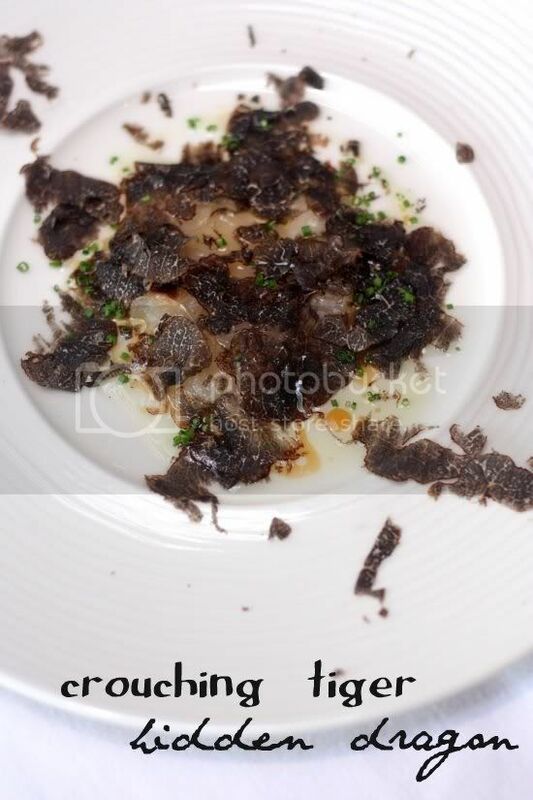 It's a deluxe version as not only is it tossed in a scraped Parmesan cheese wheel, they grate bottarga (cured fish roe) and adorn your dressed greens with black truffles. There's also artisan French Echire butter, ranked as one of the best butters in France, fin de Claire oysters shucked for you upon request and the list continues. 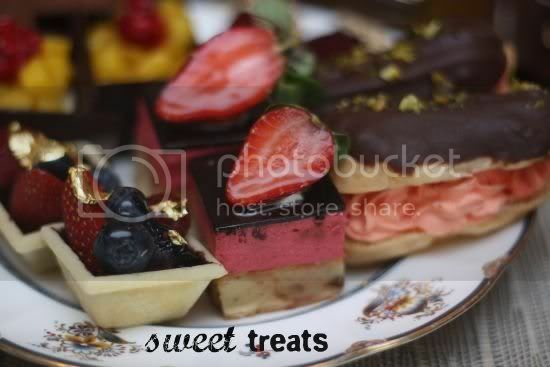 I liked how the food is artfully presented especially the main appetisers - all tucked in beautiful jewellery boxes. Even the various terrines come with landscapes of their own crafted from gelatine, pink peppercorns, star anise and micro herbs. 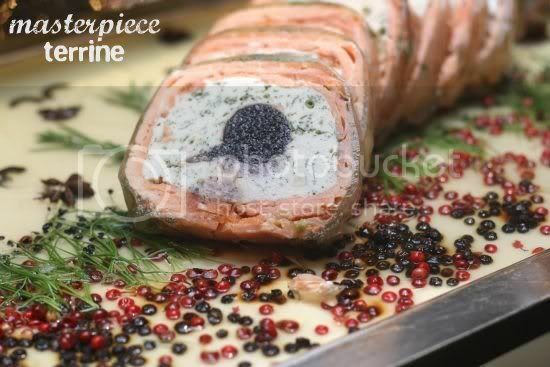 Incidentally, the terrines are also divine - the salmon one has a black caviar heart, there are some with a scallop one, filled with rich umami-tasting mushrooms and etc. One more item you should not miss on the appetizer table is this discreet looking foie gras, portobello mushroom and rocket ensemble - melts in the mouth with a burst of flavours balanced out with the slightly peppery rocket leaf. 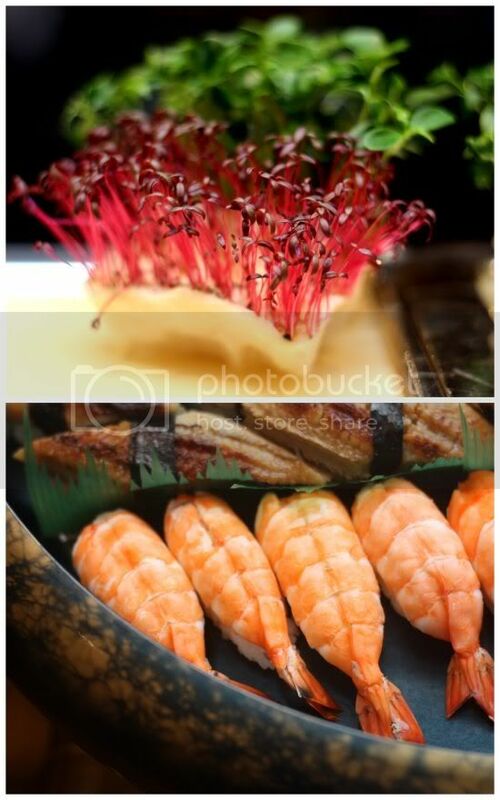 You also get a selection of Japanese appetisers on the side. 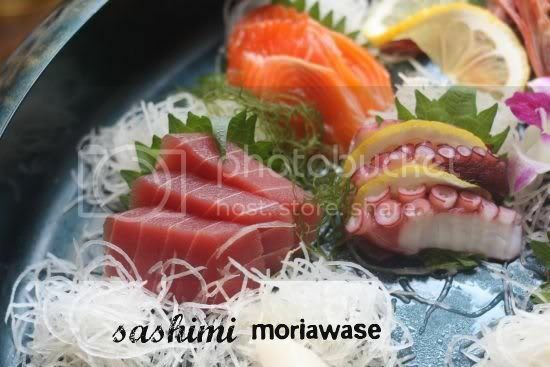 There's an assorted sashimi, various types of makis and sushis. There's even deep fried fish and a colourful selection of fish eggs. 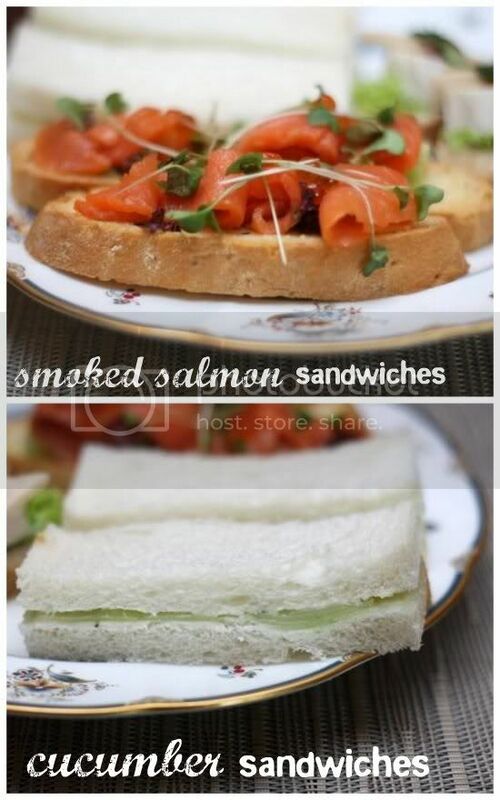 Adjacent to the Japanese table, you will find a whole smoked salmon with all the tangy dips. Leave room for desserts as they are all divine too. 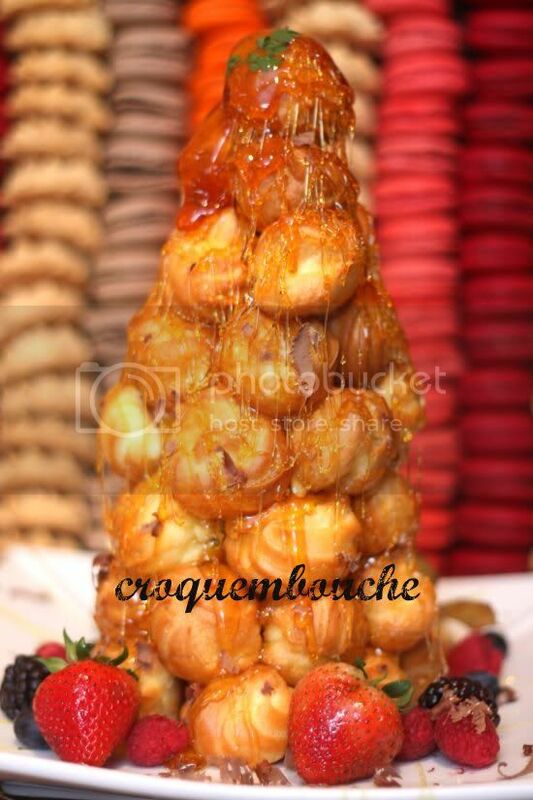 A magnificent tower of profiteroles in a form of a croquembouche take center stage here in front of an amazing wall of colourful macarons and cookies. 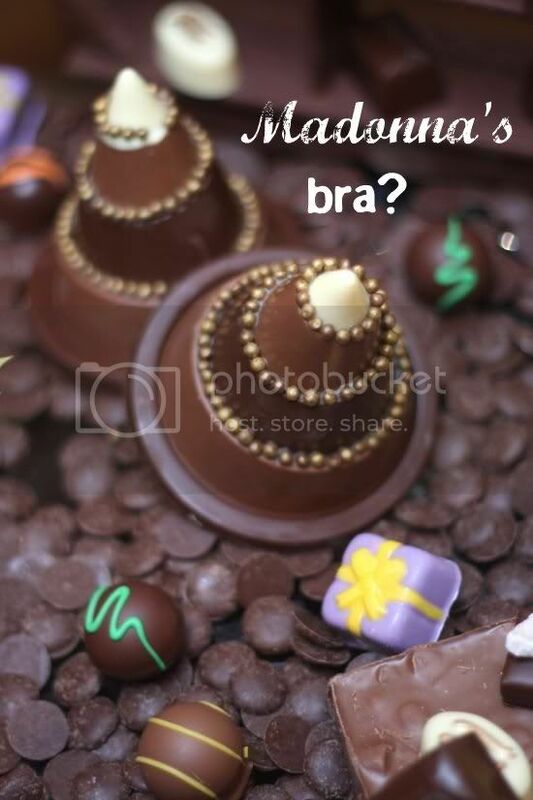 There are even chocolate displays to tempt you with beautifully formed truffles, chocolate bars and a chocolate fountain. Dip the fresh fruits, marshamallows in the flowing chocolate or if you prefer there are even pre-dipped strawberries on the side, all prepped ahead for you. 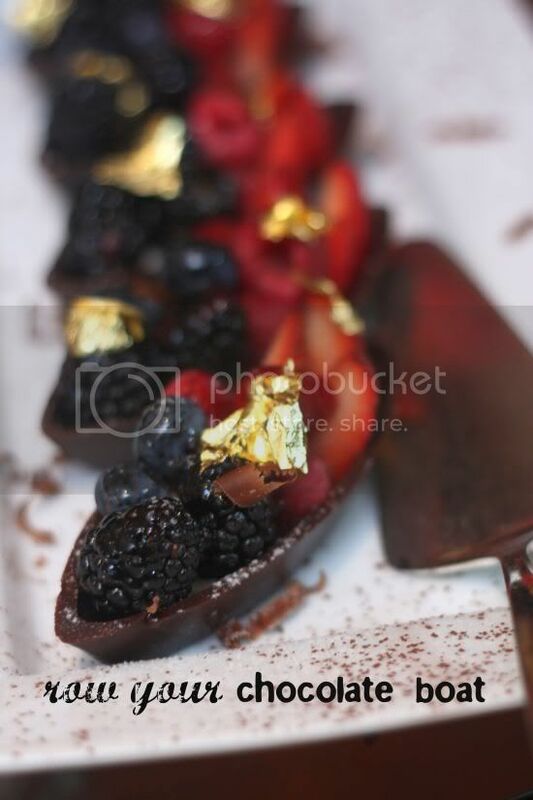 I love the chocolate tart shaped like a boat that is filled with juicy fresh fruits. They're given an added elegance with edible gold foil. The lemon meringue pie comes with a tall fluffy meringue crown that balances out the slightly tart lemony taste. Cheese lovers can zoom in on their cheese table filled with a good variety of hard and soft cheeses - bries, bleu cheese, camemberts, cheddar, goats cheese and etc. 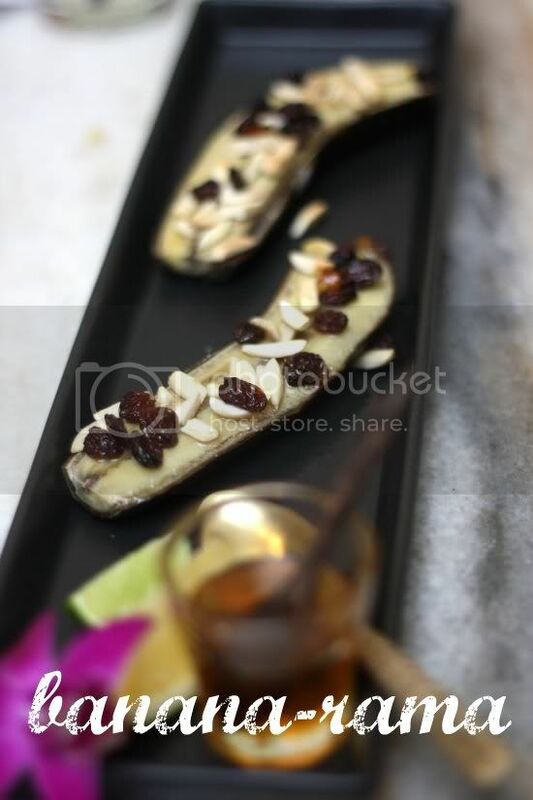 Dried fruits and fresh grapes are also available on the side for you to enjoy your cheese. Just a word on the mains, you have a choice that to pick from roast beef, roast lamb or the salmon en croute dish that will be served to your table. The salmon en croute is a magnificent looking dish in its delicate puff pastry shell with the soft yellow rice mixed with hard boiled eggs as the salmon was cooked perfectly. You will find yourself spoiled for choices here. There's also a trio of musicians to entertain the guests. For a whole lot more pictures, see my Flickr set. Ah, weekends...aren't they wonderful? Two days of utter bliss to do whatever you please....eat wherever you fancy. 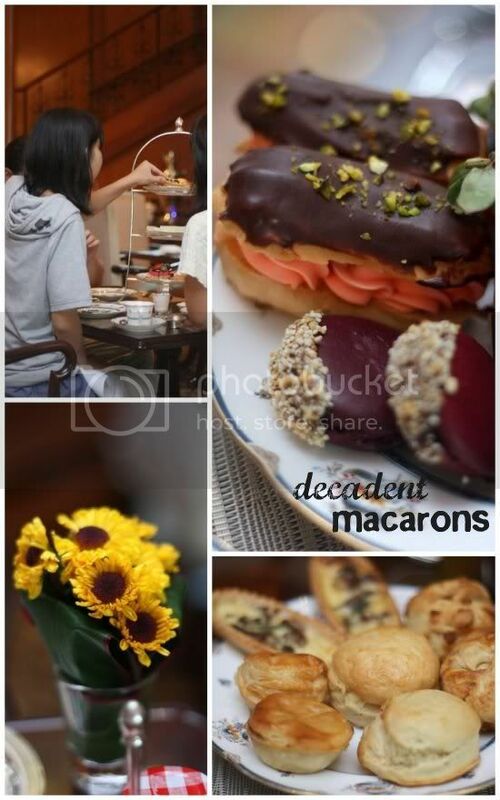 So how do you indulge during the weekend? Cook at home or just eat out at the places you wish to try. Do share your experiences. 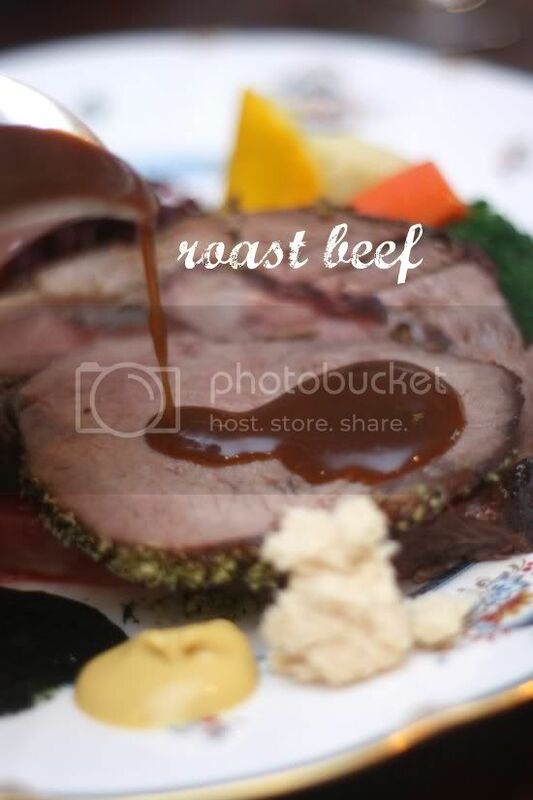 *Notice: The reviewer declares that the Sunday Roast lunch review was by invitation from the restaurant. The afternoon tea was paid for by the reviewer.